The team at zweieck specializes in Qt programming. We provide you with individual components or complete systems of the highest quality and with a fair price-tag. We possess the know-how and more than a decade of experience. Qt is the programming framework for cross-platform developing. You will find highly experienced C++ software developers at zweieck. 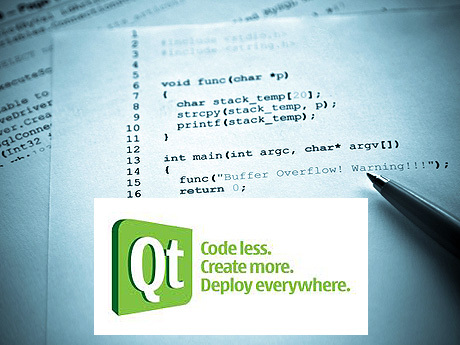 Our top experts for Qt programming develop applications for Windows, Linux and Unix (Mac). You buy from professionals: The team at zweieck has been programming with Qt since 2004. Regular trainings complement our extensive application experience. You receive the best solution: The certified Qt software developers at zweieck will find the right kind of solution. We will provide you with the required applications, adapted to your preferences. Zweieck supports large (IT-) companies in Germany, Austria and Switzerland with the development of networks and with the programming of databases as well as embedded systems. Please contact Roland Zoder for your optimal IT solution! Every company which seeks software developers for cross-platform solutions has come to the right place at zweieck. We work with the standardized programming language C++ and are experts for Qt projects.